A classic men's watch from Longines. Featuring a stylish stainless steel and yellow gold bracelet, round black dial and large numerals. An ideal watch for work or play, this is an elegant timepiece for the modern gentleman. 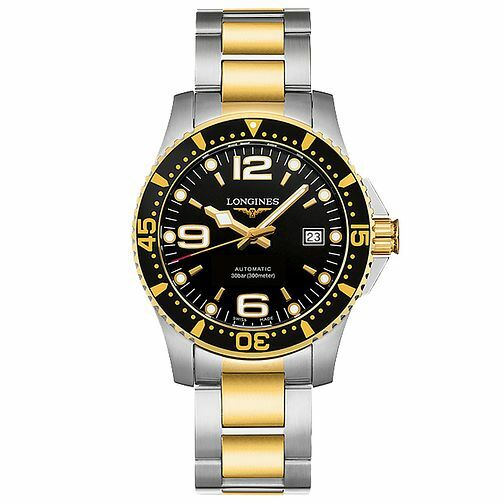 Longines HydroConquest Men's Two Colour Bracelet Watch is rated 5.0 out of 5 by 1. Rated 5 out of 5 by Anonymous from Ideal mens watch Delivery went smoothly and once signed for and then to unbox the watch took me some time as the way the watch was packed was as if it was jewellery. I was amazed at the quality and finishing, which , and it's just my opinion much better than my Omega which is three times the cost. It keeps accurate time so far and looks really good on me and often have admiring looks from people. The luminous markers are easily read in the dark and in daylight easy to read as well. The gold adds that bit of luxury.